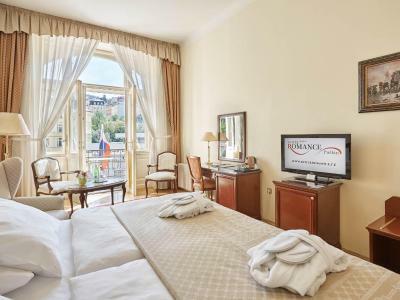 Lock in a great price for Hotel Romance Puškin – rated 9 by recent guests! Location is fantastic! Walking distance to all the major sights and spas. Breakfast was wonderful with a very large variety of food. The room was large and clean, the staff very friendly and I would definitely stay there again! 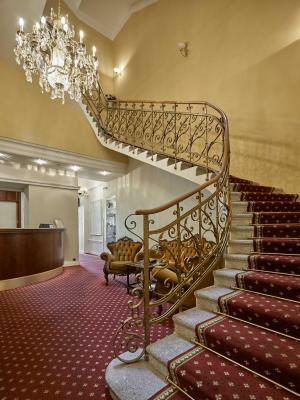 Excellent location right in the heart of Karlovy. The room was fairly spacious & very clean and a good value. 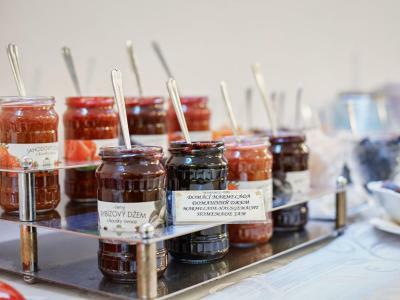 The breakfast was terrific, lots to choose from. Staff were very friendly and helpful. Would definitely stay here again. A lovely, comfortable hotel with a most gracious and helpful staff. 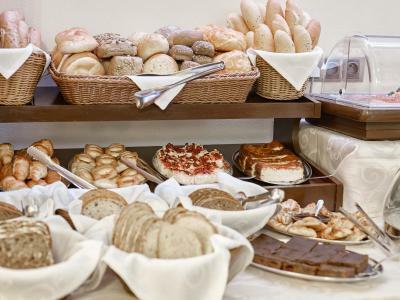 The breakfast is really great, and the food at the hotel restaurant is absolutely wonderful as well. I highly recommend you try the hotel restaurant if you stay here. 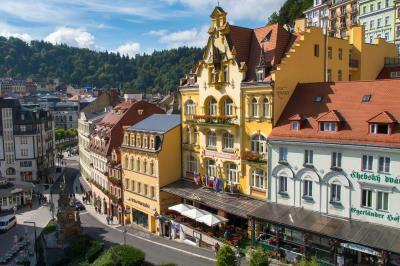 The location is excellent, although there are hotels with arguably better locations in town. The staff was helpful and friendly. This is not a bad hotel by any means. The hotel, rooms, and dining room were very clean. The room was very quiet. The breakfast was very good. The food in the main restaurant was excellent. 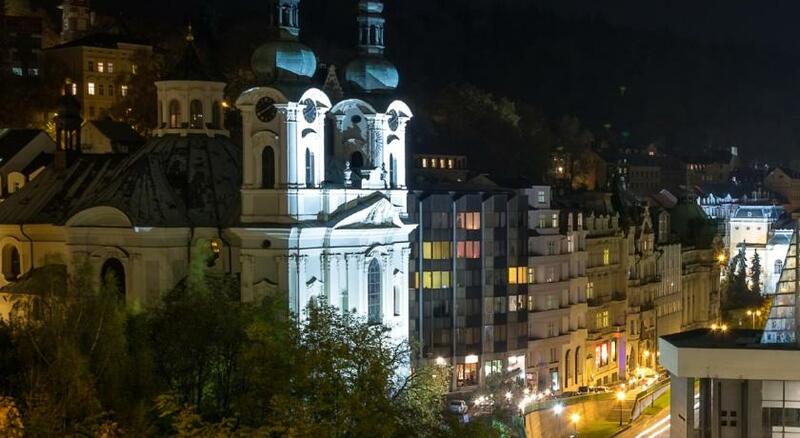 The hotel was located in the heart of the city. It was easily accessible. The decor was very appealing. The entire hotel was very well maintained. The staff was very helpful and courteous. 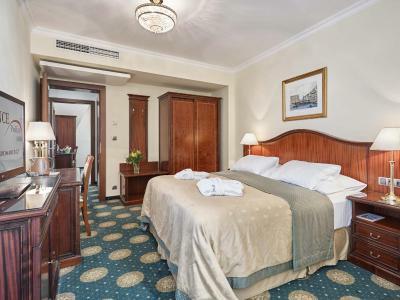 Hotel overall, room, restaurant (breakfast and dinner: very good), location, staff very pleasant, parking arranged for. 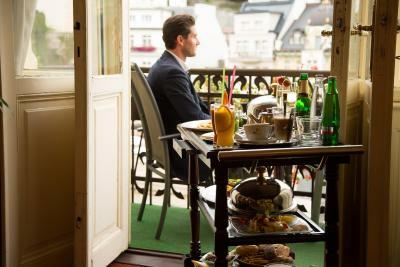 Location is superb, very good furniture, good breakfast. 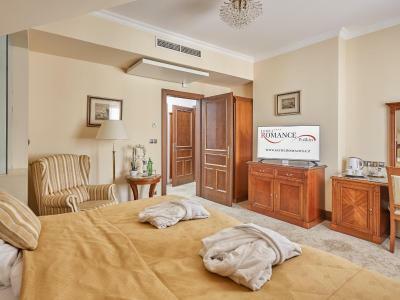 Hotel Romance Puškin This rating is a reflection of how the property compares to the industry standard when it comes to price, facilities and services available. It's based on a self-evaluation by the property. Use this rating to help choose your stay! 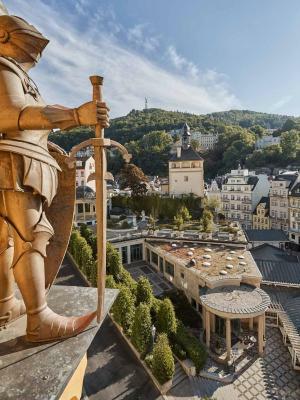 One of our top picks in Karlovy Vary.Housed in a renovated Art Nouveau building from 1899, the Hotel Romance Puškin is located in the spa center of Karlovy Vary, close to the Hot Geyser Spring and the Market Colonnade. 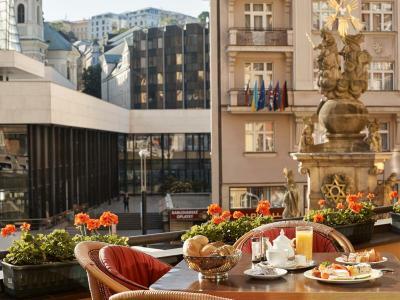 The Restaurant Romance with a summer terrace serves excellent Czech and international cuisine as well as aromatic coffee. 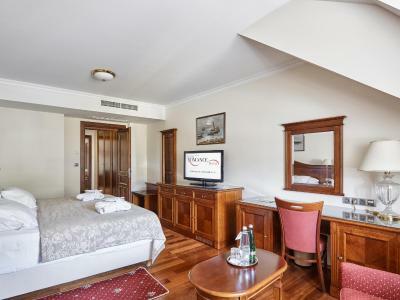 Free WiFi is available in all guest rooms of the Puškin hotel. 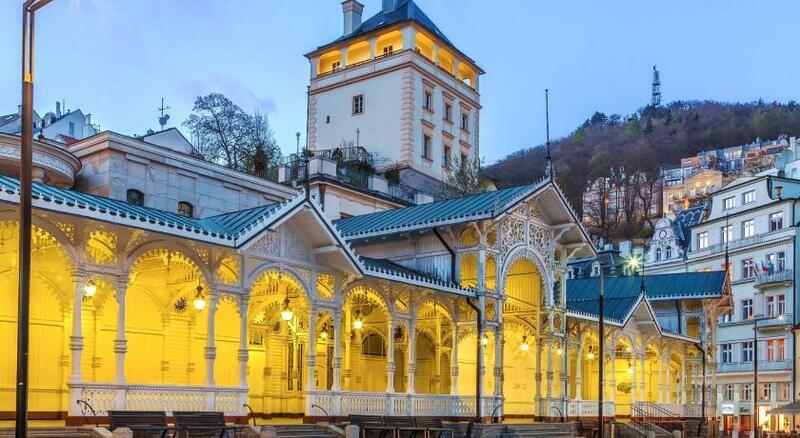 Spa treatments at the Chateaux Spa, which is located just across the street, can be arranged. Hotel guests get a discounted price. 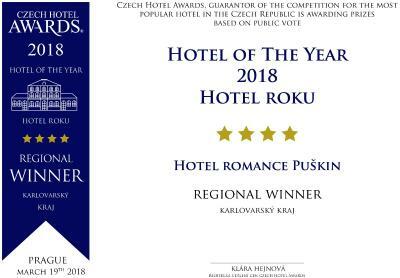 When would you like to stay at Hotel Romance Puškin? 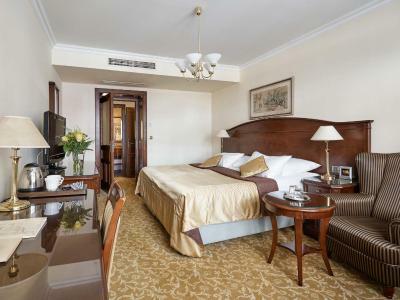 Double room in the front part of the hotel, furnished in an Italian style, featuring views of the colonnade and a tea/coffee maker. Double room with an extra bed and with views of the back of the hotel. Please note that further extra beds are not available in this room type. This nonsmoking apartment includes 2 bedrooms, an air conditioning and a bathroom. 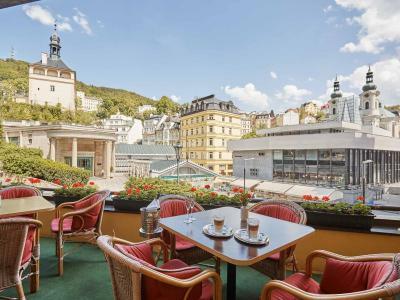 Large double room in the front part of the hotel with views of the colonnade and a balcony. 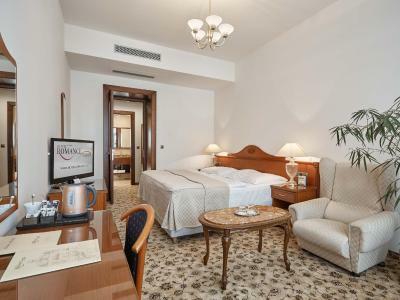 It is furnished in Italian style and includes free tea and coffee-making facilities, bathrobes and a bathroom scale. This room is on the ground floor and has a small skylight window. 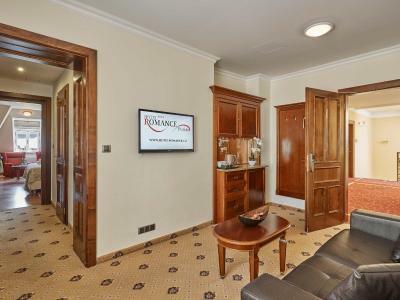 Large suite with a living room and a bedroom offering views of the colonnade. 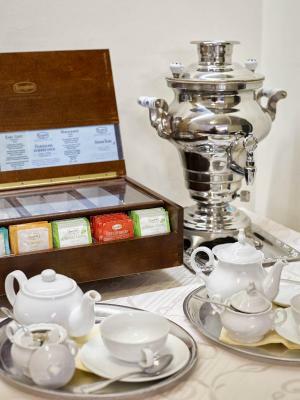 It includes free tea and coffee-making facilities, bathrobe and a bathroom scale. 2 extra beds are available in this room type (please see Hotel Policies). View of the inner part of the hotel. The room is located on a lower floor. 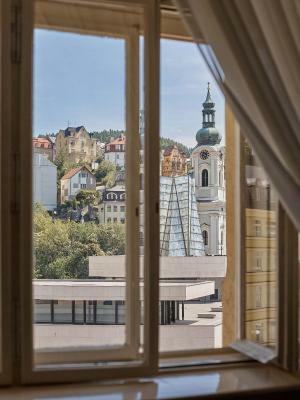 Renovated in 2014 and in the back part of the hotel, this room comes with air conditioning, tea and coffee-making facilities and views of the courtyard or the greenery. In the back part of the hotel, this room features views of to the courtyard or the greenery. 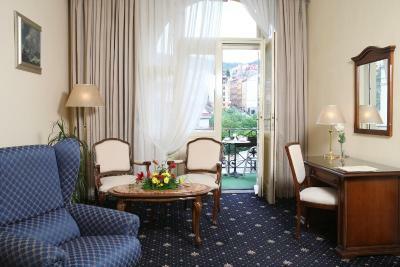 Located in the back part of the hotel, this room offers views of to the courtyard or the greenery. 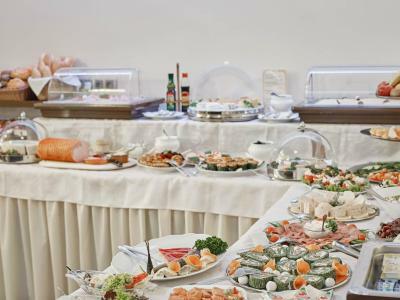 We are a classic family-style four star hotel with ambiance, very kind staff and exceptional breakfast to start up your great day on vacation. . 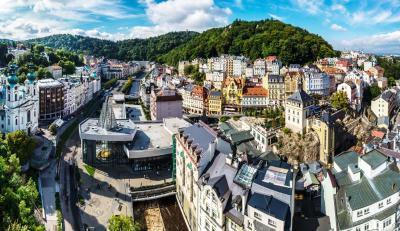 In summer you can enjoy the pleasant outdoor terrase, where you can relax and watch life go in beautiful and romantic Karlovy Vary. During the cold winter months get yourself pampered with relaxing massage and enjoy the rejuvenating hot springs. 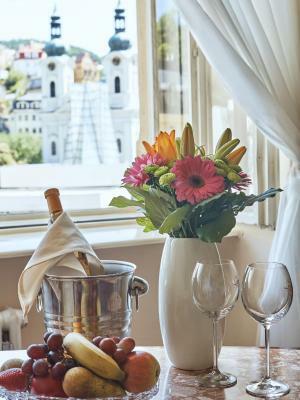 House Rules Hotel Romance Puškin takes special requests – add in the next step! 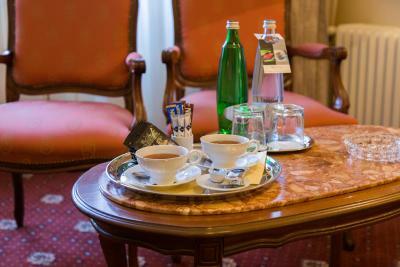 Hotel Romance Puškin accepts these cards and reserves the right to temporarily hold an amount prior to arrival. 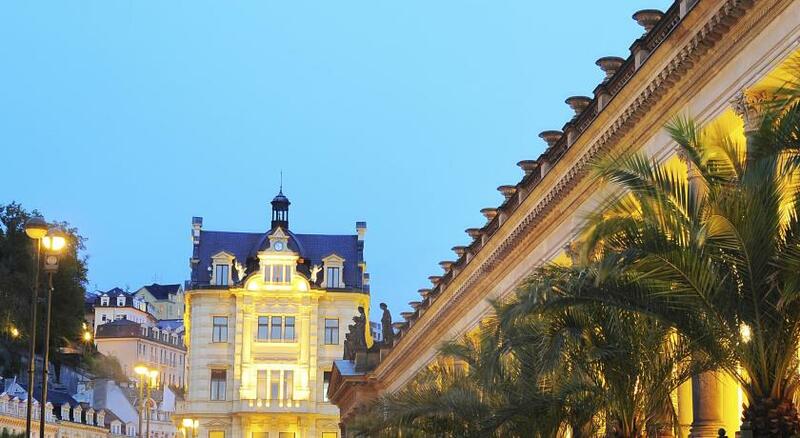 The daily exchange rates of the Czech National Bank are applicable when paying in CZK or by credit card. Guests needing a confirmation for the embassy to apply for a visa are kindly requested to contact the hotel after booking. Please note that the restaurant is opened from 07:30 till 22:00 for a-la-carte orders. Please note that bringing a pet will result in a surcharge of EUR 20 per night. Pets are not allowed in the restaurant. Quality of the room, the cleanness. Excellent location, I went downstairs to drink spring water before going to bed, and first thing in the morning. Excellent breakfast. The hotel charged me 7 euros for a beer taken in the mini bar. It's completu outrageous taking into account prices in the area. I wouldn't recommend this hotel. The breakfast was incredible - a huge variety of delicious foods! The location was perfect - right in the heart of town! The parking situation is a little bit tight and pricey. We had to park about 10 min away which cost about $13 per day. Dog fee was almost $23 a day, I think that is a little much and definitely more than I ever had to pay before. The bed was a little hard and our room faced a dark alley so not much natural light. Perfect stay! Kind and helpful staff.